To access electronic resources off-site, please use the following guide. Please note that these resources are only available to those who have a current Library barcode. The expiration date of this barcode is based on the expiration date of your NYBG ID, (for example, a Staff ID, Volunteer ID, Member ID, etc). Please be aware that sharing your login credentials with others is in direct violation of our licensing agreements with our vendors, and will result in the loss of your Library privileges. Please email the Library if you experience any trouble accessing our online resources. 1. You will need to have your Library barcode in order to access materials. 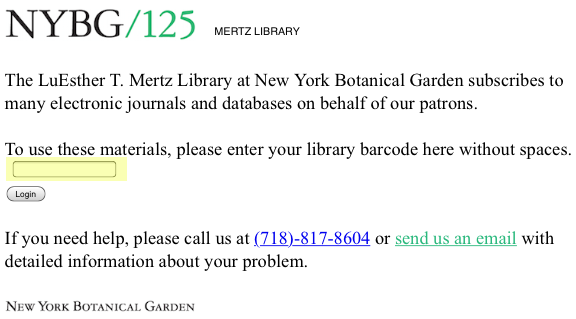 This barcode should be on the back of your NYBG ID. However, if it is not on the back of your ID, please email the Library and the Library staff will provide you with your barcode. 3. Navigate to a database you would like to search. JSTOR is a great resource because you can find a lot of full text articles. Please note that in order to be prompted for your login credentials, you must access JSTOR through the Library's website. The URL for access is as follows: http://nybg.idm.oclc.org/login?url=http://www.jstor.org. Alternatively, find a link to JSTOR by navigating to Databases on the libraries main page. This will bring you to a list of databases and resources, arranged in alphabetical order. 4. You will arrive at a login screen. Enter your Library barcode with no spaces for the username. 5. You are now able to search JSTOR! This same login screen will pop up if you click on any other database in the Library's list of databases, and the login procedure is the same. 6. If you experience any problems, please call or email the Library for assistance.